is an Austrian skydiver and a BASE jumper. He set the world record for skydiving an estimated 39 kilometres (128,000 ft), reaching an estimated speed of 1,342 kilometres per hour (834 mph), or Mach 1.24, on October 14, 2012.He is also renowned for the particularly dangerous nature of the stunts he has performed during his career. Baumgartner spent time in the Austrian military where he practiced parachute jumping, including training to land on small target zones. on 14 October 2012. As part of said project, he reached the altitude record for a manned balloon flight. 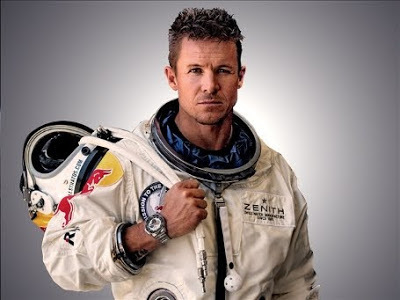 Today, (October 14, 2012) extreme athlete Felix Baumgartner landed safely after a 38-km leap to Earth in bid to break sound barrier.